How do you feel when you understand something totally new? Imagine your co-workers, clients, employees, or yourself learning anything with ease. 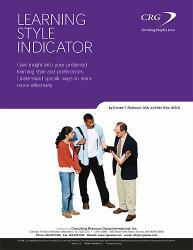 The Learning Style Indicator (LSI) addresses the way people learn. It empowers your mind to learn or the minds of your clients. As a coach, teacher, leader, or supervisor, you will find the LSI an invaluable tool for getting the best results for any job. It is the smart pill—without the side effects.